We held the event at our waterfront municipal lot from 3 to 6 on Thursday afternoon, 9/14. 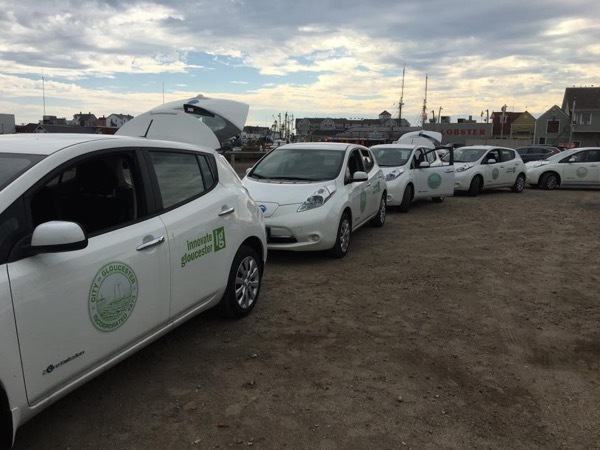 We had the City's EV fleet on hand, one of the largest in the state, which included 6 Nissan Leafs and 2 BMW i3s. The Massachusetts Energy Consumers Alliance was also present, as was Gloucester Green, our local sustainability initiative. Dealerships include Peabody BMW, Lynnfield SMart, Sudbay Chevrolet, and Milford Nissan. 4 local residents brought their EVs, and 1 business. We had a steady stream of people coming in and out during the 3 hours, between 50 and 75 people total. Mayor Sefatia Romeo Theken attended the meeting, as did Gloucester Police Chief John McCarthy. Next year we intend to do an event and provide food or entertainment to attract a larger audience. We may also partner with the local farmer's market, too. This event will be part of Gloucester Green, which is a Mayoral initiative to help residents save energy and save money, while promoting clean energy. We will have our 6 Nissan Leafs and 2 BMW i3's on display for the public. Local dealerships will have a presence and potentially offer test drives. We reached out to the MOR-EV program to see whether they could have reps attend as well. We encourage local EV owners to bring their cars onsite as well! Drivers and visitors: register by clicking the blue button at the top of this page and you'll be entered to win a chance at a $250 gift card. Registered attendees report 76,984 electric miles driven.